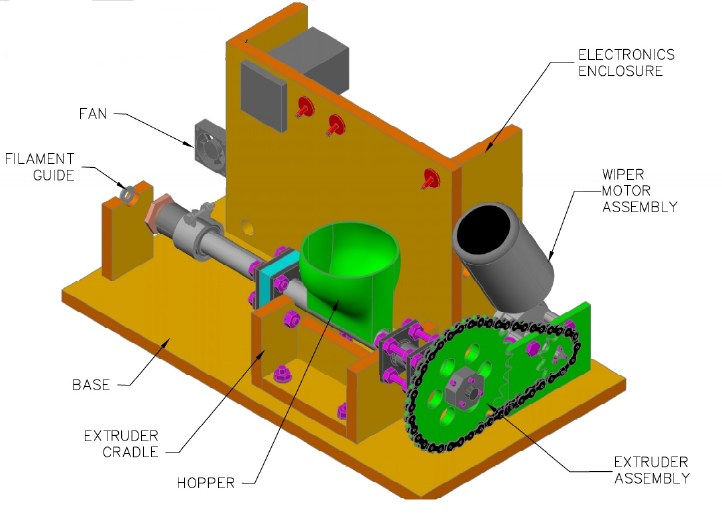 The Lyman Filament Extruder turns plastic pellets into filament that can be used for 3D printing. It was named after its inventor, Hugh Lyman. It is open source hardware and all of the plans can be downloaded from Thingaverse, thing 30642. Rather than buying expensive filaments sold by retailersthe Lyman Filament Extruder offers the option to minimize the expense of 3d printing by converting inexpensive pellets into 3d filament. It can be built in under 8 hours and the cost for materials is about $250 (the downloade for the plans is free). Hugh Lyman, at age 83, took on the challenge that the Desktop Factory Competition presented in June 2012 to create open source hardware to convert plastic pellets into filament that could be used for 3D printing. He won the challenge and was awarded $40,000 USD. With this invention, he made 3D printing more affordable for home use.